With spring coming fast, it’s time to start thinking about your backyard setup. Has your mismatched patio set stayed a season too long? Has the bistro table lived out its last leg? Winter gives us a break from addressing our out-of-date backyard furniture, but now that the sun is shining bright, it’s time to get to work! From chairs and tables to pillows and lanterns, we’ll share different ways to spruce up your outdoor space with some of 2016’s hottest outdoor furniture trends. There is no better way to shake the winter slump than by opting for a white-hot patio theme. Chic and ultra-modern monochrome furnishings are becoming the new “it” style, giving way to light and bright decor and accessories. Easy to incorporate into most backyards, colors like white, gray and beige work best when complemented by punchy, bright colors like turquoise, green and fuchsia. Citrusy colors have also been popular, and oftentimes add the perfect amount of flair to a neutral, subdued color pattern. If you’re looking to turn up the heat on your patio furniture, we suggest a modern bistro table paired with chairs featuring bright cushions and pillows. If you’re color-shy, start by adding small amounts, like the banding of a pillow, or a small pattern on a dining set or light fixture. Slowly build your color impact by throwing in a bright-colored cushion or mat, and you’ll be off to the races. Bringing the dining experience outdoors is one of our favorite trends for 2016. Now that you’ve designed your dining room interior, it’s time to give a little attention to your exterior eating area, too! We love using pieces that could be found in a formal dining room, like an area rug or dinnerware set, and giving them a rugged touch by pairing them with indoor/outdoor fabrics and lighting accents. One of our favorite outdoor dining styles is a blend of casual and elegant. 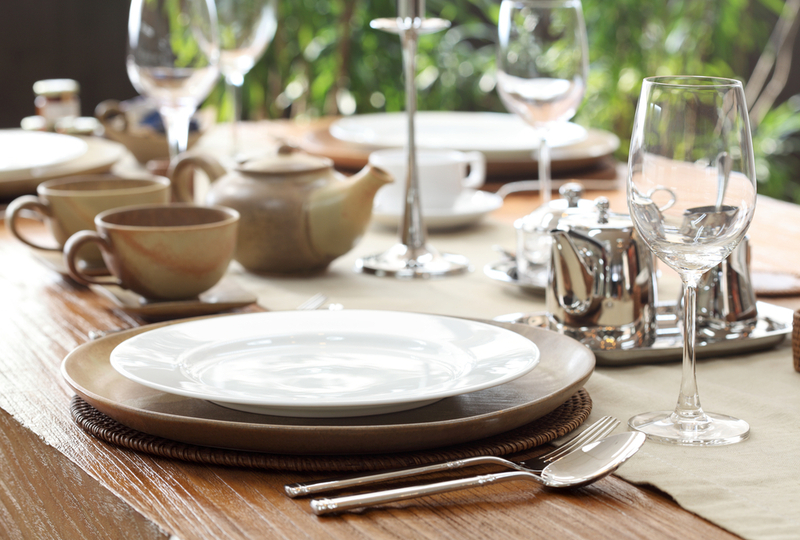 Start by pairing light furnishings with earthy fabrics, like linen, to set your dining table. If you want more color, a teak dining set pairs perfectly with a soft blue color palette with metallic accents, like table settings, candle sconces and centerpieces. Anchor your space with a durable rug in a chic, coastal pattern, and add candlelight lanterns along the table to illuminate your design. Don’t forget a bar cart equipped with a few bubbly essentials, and plenty of friends to toast the evening! 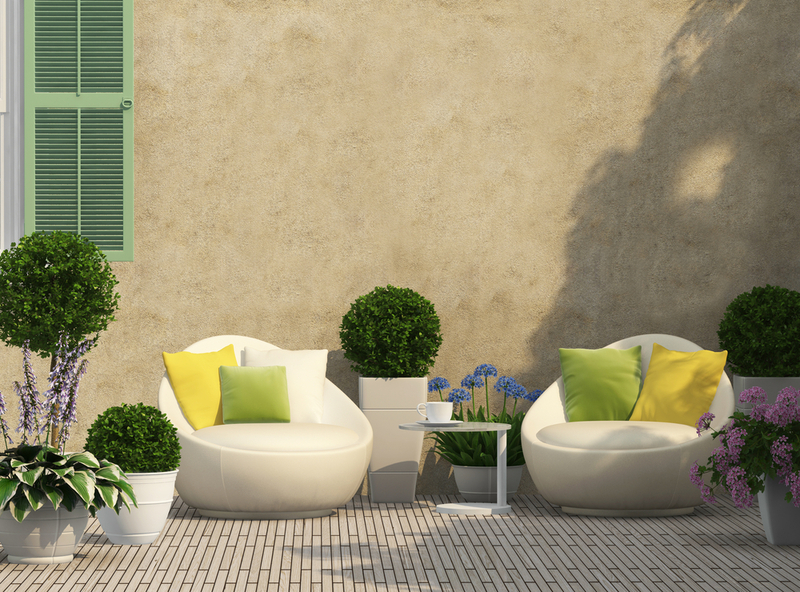 If you have a smaller patio or outdoor lounging space, make the most of it with neutral colors and supple textures. While soft color palettes have dominated the interior design world, there’s no reason they can’t translate to the great outdoors. Use textures and colors found in nature, like bamboo, jute, and sisal to downplay any size restrictions and make the space more fluent with its surroundings. Use beige as your foundation color if you’re looking to warm up your backyard. Choose gray if you want to cool things down. Gray also looks best with complementary colors like orange or purple. Don’t forget a vase full of fresh greenery to add the perfect extra touch to your outdoor oasis! Now that you’ve moved your dining room outside, why not have your kitchen follow suit? Outdoor kitchens are all the rage in California, and the idea is quickly spreading across the United States as more and more people want to enjoy food with their friends in the great outdoors. Today, building an outdoor kitchen can be as easy as designing your indoor space. First, decide what you’ll be cooking. Are you a grill master? King or queen of the margarita mixer? Is a flaming fire pit essential to your cuisine? Once you’ve narrowed down what you’ll use your outdoor kitchen for, you can begin selecting pieces that coincide with your design. Match your decor accessories with your open-flame grill to conquer your next outdoor feast. Create the perfect kitchen for your cocktail concoctions with outdoor refrigerators, bar carts and other essentials for mixing your summertime elixirs. Lastly, make sure you have ambiance to match with string lights, torches or lanterns for the perfect amount of flair. Try experimenting with one or more of these styles in your own space and see what works best for you. What are some other outdoor furniture trends you’re looking forward to? Kerrie Kelly is an award-winning interior designer who has been advising homeowners on outdoor furniture and design for many years. Kerrie runs her own California firm, Kerrie Kelly Design Lab. For more research on outdoor living home ideas, including topics discussed by Kerrie, you can review Home Depot’s patio furniture selection online.